About Us - Pediatric Dentist in Lee's Summit, MO. Dr. Mathew began his career as a general dentist in a mission hospital in Southern India. After practicing for almost three years, he moved to the United States in 2001 to pursue a Masters degree in Dental Public Health at the University of Michigan School of Public Health and a residency in Dental Public Health at the State University of New York in Albany. After residency he worked at the Missouri State Department of Health and Senior Services. For over 7 years, he was a Clinical Assistant Professor at the UMKC School of Dentistry - Department of Dental Public Health. He completed the DDS program at UMKC School of Dentistry. 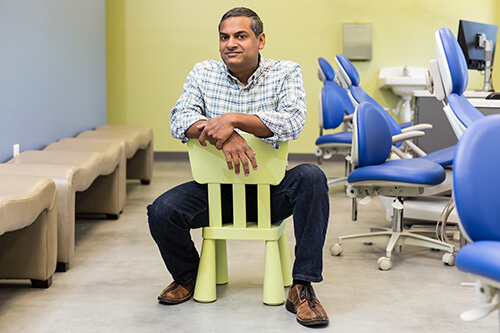 While working with a diverse population in Dental Public Health, it became apparent to Dr. Mathew that he especially enjoyed, and has a gift for working with children. He decided to combine the compassion that inspired his public health emphasis with his passion for providing the highest quality dental care for children and enrolled in the Pediatric Dentistry Residency program at the University of Rochester in upstate New York. As a Pediatric Dentist, Dr Mathew has been an Associate in practices in the Kansas City area in Missouri and Kansas. Dr. Mathew is a Diplomate of the American Board of Pediatric Dentistry and the American Board of Dental Public Health. He is also a member of the American Academy of Pediatric Dentistry, American Association of Dental Public Health, and American Dental Association. Dr. Mathew’s many years of experience as a compassionate champion for dental health, coupled with his ability to make children’s dental visits a fun and positive experience make him uniquely qualified to care for your child. Dr. Mathew is a believer in the power of music to assist children through dental visits. He enjoys traveling, and exploring the great outdoors with his family, especially North American National Parks!